Discuss and carry out remediation plans for critical Site24x7 monitor alerts from your Teams channel. Enhance the DevOps experience by managing Site24x7 alerts in Teams. 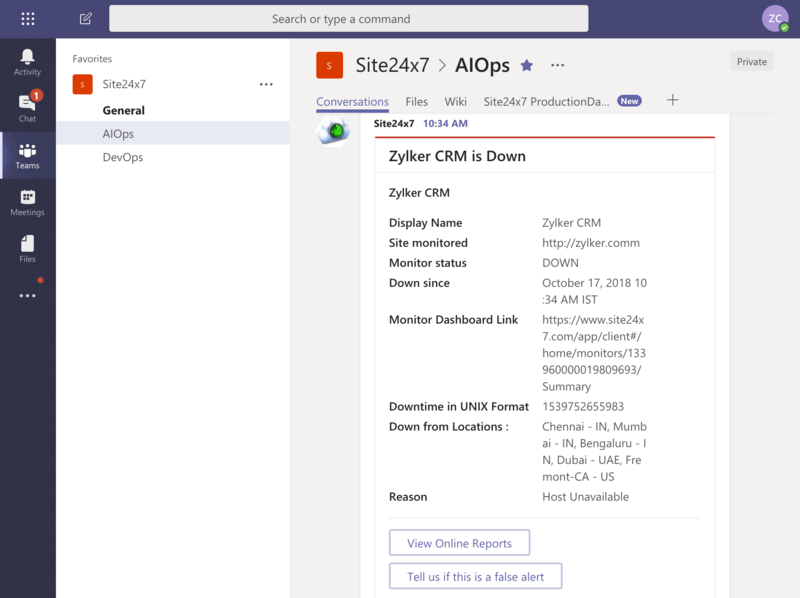 Seamless connection: Access real-time alerts and reports in Teams with Site24x7's native connector. Smart dashboards: Achieve faster analysis and troubleshooting with Site24x7’s custom dashboard in Teams. Intelligent interactions: Ask questions and receive accurate responses on monitored data from our natural language processing (NLP)-based chatbot for Teams. How DevOps can benefit from Site24x7’s integration with Teams. 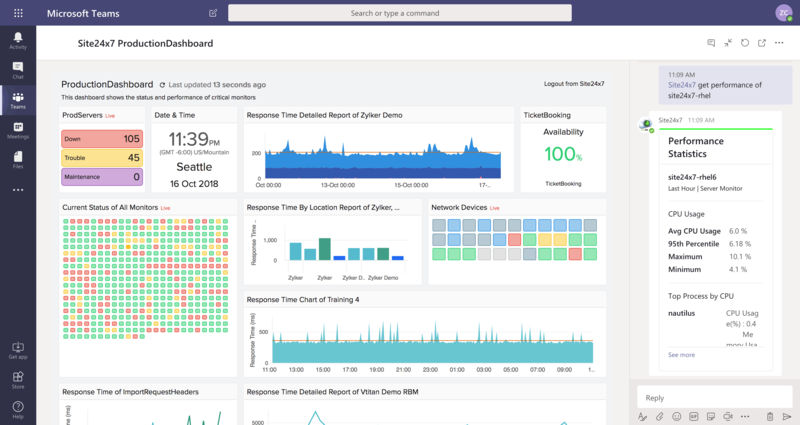 See how data-driven conversations in Teams help your DevOps team achieve faster incident resolution goals. Visualize and analyze dashboard data in Teams. Bring your custom dashboard—a single cohesive interface for analysis and troubleshooting—to the Teams tab. 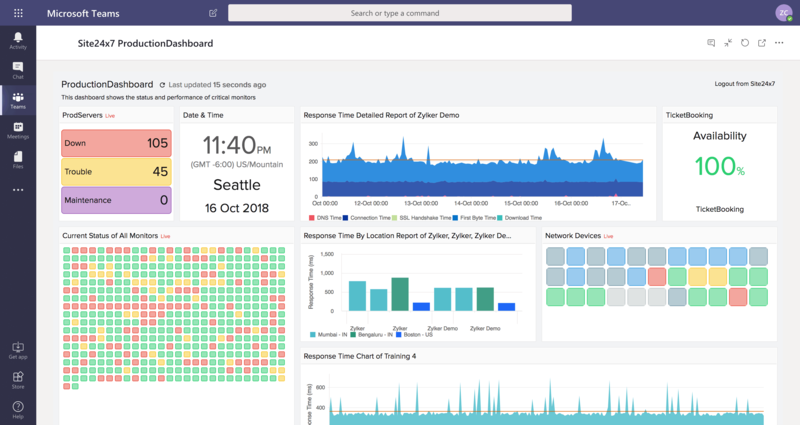 Engage in rich, productive discussions about monitored data in real time, and share troubleshooting tips with peers for faster incident resolution. Interact with chatbot for richer ChatOps experience. Ask our NLP-powered chatbot anything related to Site24x7 monitoring, and get instant responses to reduce your mean time to repair and improve overall productivity. Connect and receive real-time alerts via Teams. Have targeted, actionable conversations about potential Site24x7 incidents and root-cause analysis reports in your Teams channels. "Site24x7 has always been a versatile and reliable monitoring suite for our online operations. The actionable alerts and in-depth reports have ensured we respond to emergencies promptly. Being a workforce operating on Office365, we found great value from using Site24x7's integration with Microsoft Teams. It has empowered our IT person(s) to stay informed about service outages, collaborate faster, and reduce the overall mean time to resolve (MTTR)." IT and Systems Manager, Original Ltd.
A service by Corp . © 2018. All Rights Reserved.